Gentleman’s Auction Offers Holiday Gift Ideas | Intriguing & Luxurious Items Available for Online Bidding | Skinner Inc.
BOSTON, MA – November 18, 2014 – Feeling stuck on what to gift the man who has it all this holiday season? Skinner is here to help, presenting its very first Gentleman’s Auction, a highly curated, online auction running from November 20th through December 1st. From gold cufflinks, antique maps and pocket watches, to rare ales and spirits, sporting prints, and much more, you’ll discover exceptional gift ideas at range of price points for even the most discerning gentleman on your list – or, for yourself! The auction will spotlight thirty-five hand-picked selections from The Cary Collection, including mid-century modern finds from the likes of Gucci, Dunhill, Abercrombie & Fitch and The House of Hardy – offering but a glimpse into a vast assemblage featuring thousands of rare books and objects collected over decades. Gift-givers can avoid long lines on Black Friday, and bid with privacy and convenience at any time during the 11-day online auction. Browse, bid, and connect with your inner gentleman! How does a gentleman dress and carry himself? This auction has you covered with an array of fine sartorial selections, jewelry and accessories. Highlights include a custom Italian wool suit and custom shirts by J. Hilburn Custom Clothier (Lots 1 through 3, various estimates). Choose the perfect accompaniment among an assortment of beautiful cuff links, led by a pair of 18kt gold and sapphire cuff links (Lot 10, $500 to $700). 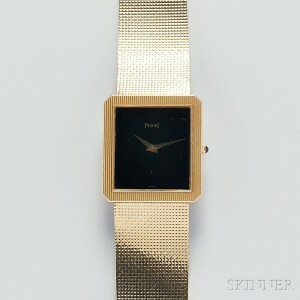 A grouping of wristwatches will also be on the block, including vintage timepieces by Piaget, Movado and Hublot. For a more traditional accessory, peruse a range of timeless gold pocket watches. Several brilliant items by Gucci, many hailing from the Cary Collection, will also be up for auction, including a Gucci stitched leather and canvas briefcase (Lot 25, $1,000 to $1,500) and leather writing folio with pen (Lot 96, $350 to $500). A medley of distinctive items, ranging from art to antique sporting gear and shooting accessories, Capture the lifestyle of the gentleman who enjoys outdoor pursuits. Highlights include Frank Weston Benson’s 1925 print Teal, bringing the serenity of ducks on a pond indoors (Lot 46, $250 to $350). For the fly fishing enthusiast, a 20th century House of Hardy “Hardy Graphite” 8-foot fly rod, is sure to delight, arriving in a navy blue canvas sleeve (Lot 52, $700 to $1,000). Golf lovers will enjoy the vintage look of a St. Andrews Hickory Highlander Putter for Abercrombie & Fitch, handmade in Scotland, 20th century (Lot 56, $350 to $500). For the horse racing fan, the auction includes a Tiffany & Co. sterling silver and enamel cigarette box , given to the winner of the 1971 Belmont stakes and featuring the jockey’s silk and cap in enamel, along with an engraved inscription (Lot 63, $3,500 to $5,000). And finally, what better way to imbibe during a long day outdoors than with a pair of Cased Twin Flasks by Gucci? 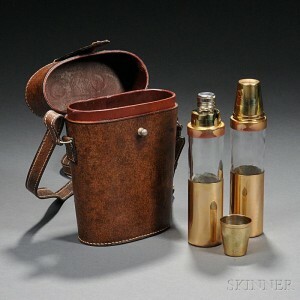 The classic metal flasks are housed in leather hip case (Lot 82, $600 to $900). Every gentleman needs a place to call his own. The auction offers a variety of artworks, collectibles, and accouterments for the office, desk, or bar. A stunning piece for display is Stanley Wanlass’ ‘Free Wheelin’ bronze sculpture, a sculpture by the American artist renowned for his heroic historical monuments (Lot 59, $12,000 to $18,000). A cased Mortimer dueling pistol set from the mid19th century brings back a bygone era in history and leads a selection of antique pistols (Lot 32, $6,000 to $8,000). Also sure to stand out on one’s shelves is a pair of ’21’ Club teapots from the mid-20th century, with a design featuring the gate to the legendary New York institution (Lot 89, $400 to $600). Prints and photographs to adorn the gentleman’s study include a gorgeous image of Marilyn Monroe in the Hollywood Hills, taken by George Barris in July 1962, shortly before her untimely death (Lot 23, $800 to $1,200). As a gentleman would not be caught without a well-stocked liquor cabinet and all of its necessary trappings, Skinner will offer fine spirits, ales, attractive glassware, ashtrays and other pieces of barware. One of the best American bourbons will be on the block: A.H. Hirsch Kentucky Straight Bourbon 20-Year (Lot 80, $3,000 to $4,000), in addition to one bottle of Samuel Adams’ Millennium 1999, in its original wooden case (Lot 81, $1,000 to $1,500). Skinner auctions draw international interest from buyers and consignors alike, with material regularly achieving record prices. The company’s auction and appraisal services focus on fine art, jewelry, furniture, and decorative arts from around the globe, as well as wine, fine musical instruments, rare books, Asian art, clocks, Judaica, and more. Monthly Skinner Discovery auctions feature a breadth of estate material. Widely regarded as one of the most trusted names in the business, Skinner appraisers have appeared on the PBS-TV series, Antiques Roadshow, since the show’s inception. Skinner has galleries in Boston and Marlborough, Massachusetts, as well as in Coral Gables, Florida, with bidders participating in person, by phone, and online. Join auctions live with SkinnerLive! and Bidsquare. For more information and to read our blog, visit the website atwww.skinnerinc.com, find us on Facebook, or follow us on Twitter. This entry was posted in News and tagged Abercrombie & Fitch, Cartier, cuff links, dueling, Dunhill, fine spirits, fine watches, gentleman's attire, gentleman's auction, gentleman's clothing, gentleman's study, gifts for father, gifts for gentleman, gifts for husband, gifts for men, Gucci, holiday gift guide, holiday gifts, House of Hardy, J Hilburn, liquor, luggage, luxury, Movado, Piaget, pistols, sporting goods, Tiffany by Skinner. Bookmark the permalink.